Having the ability to specify who receives your e-newsletter lets you tailor your message to specific groups of readers. For example, you may want to advertise a “new customer special” only to prospects and not current clients. No one likes getting the “special offer for new customers only” email when they have been a loyal customer for years. It feels unfair, unpersonalized and clutters up their inbox with non relevant emails. 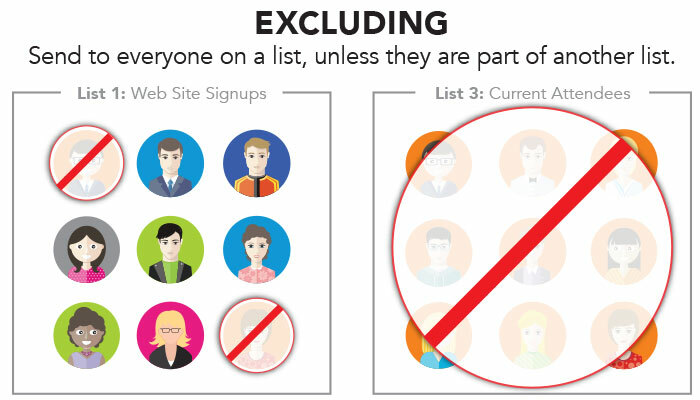 There are many reasons you may want to divide your lists and then select only specific groups to send to. Even if you are providing the same general information or offer, the more you customize the message to the recipient the better engagement you’ll have. You can read more about segment examples here. Mail on the Mark features many useful list tools to make it easy for you to send to just the right list. Let’s walk through these features, using the scenario of promoting an upcoming conference or event. Mail on the Mark has no limit to the number of lists that you can create. We encourage our clients to divide and label their email recipients into as many useful lists as possible. To start with, it’s good practice to create different lists for the different ways people join your lists. For example, you may have one list for people who registered for a previous event, another for people who join by using the form on your web site and another for contest entrants. As people buy tickets for your upcoming conference, you can create a new list of ticket buyers. If anyone ever wonders how they got on a list, you have a record of where they signed up. Additionally, you can create your own lists based on other information you have about the recipient. For example, you could divide your list by geographic location or industry sector if you’ve collected that data. Cross checking your email lists is one of the most essential features of Mail on the Mark. If you’ve taken our advice and created multiple lists for your recipients, it’s likely you’ll find that some people are on more than one list. 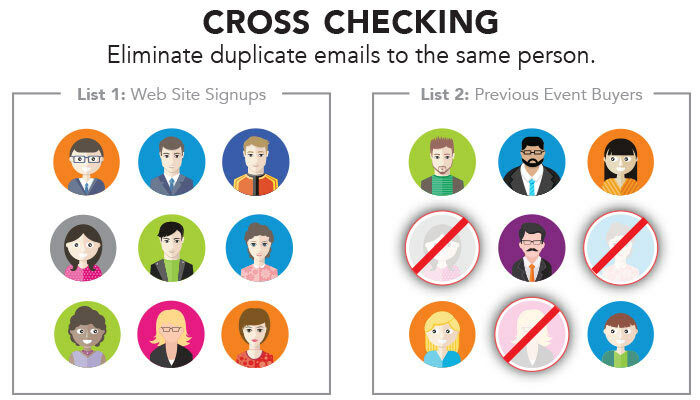 Mail on the Mark’s Cross Checking tool automatically scans across lists and detects if an email is a duplicate and only sends one email. Let’s say you have a customer that you have multiple touch points with—they originally signed up for your e-newsletter using a form on your web site, then they purchased a ticket to a previous event, then they entered a contest or give away. 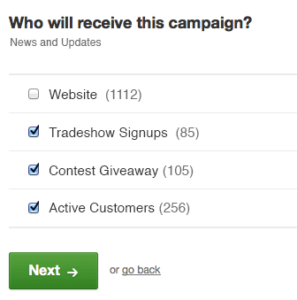 If you have been creating multiple lists to track all of these signups, that person is now on three lists. Isn’t it annoying when you get the same email twice (at exactly the same time) from an organzation? That won’t happen with Mail on the Mark. Excluding can be very helpful when you need to make sure someone doesn’t get an email. We use this function a lot when doing event promotion. Consider this scenario: Initially, you announce your event to all your lists and encourage them to buy tickets. Once people start buying tickets you start building a second list of current ticket buyers (aka attendees) only. You may not want to send emails to promote buying tickets or special ticket offers to those who have already purchased them. In this case, you would exclude ticket buyers. 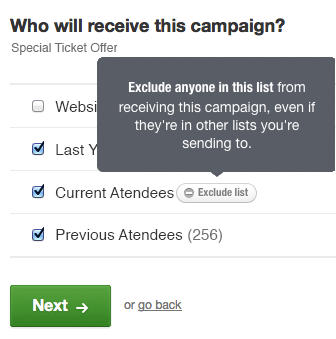 By hovering over a list or segment in Mail on the Mark, you will see the option to exclude them from the campaign. These are a couple of useful tools to make sure that your recipients are getting only the content that’s relevant to them. This helps your emails feel more personal and helps build trust with your subscribers. Remember, a more customized email marketing strategy leads to more engaged readers. Have a question about a feature of Mail on the Mark, or want to know how this tool could help your business? Get in touch, we’d be happy to talk with you about your email marketing. < Do you have permission to send your E-Newsletter?